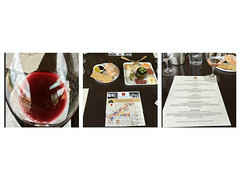 This is going to be one of my longer posts because the tour I went on was so choc-o-bloc full of incredible tastings and things to do! My day started by meeting up with Laura of 101 Wine Tours for an invitation only Media Tour at their office in Arroyo Grande. Scott was our driver and Laura our tour guide/Sommelier. Other members of the media Kathy and Photographers Amy and Donny from Tolosa Press also met up with us, and we all climbed aboard the 11-passenger Mercedes Sprinter Van. We headed over to the Madonna Plaza and picked up the rest of our group Haley of New Times and Edible SLO, Sally from The Tribune, and winemaker Adam from Center of Effort Winery and then, we were off. Traveling up the coast toward Paso Robles, the landscape after rain bursts with emerald vine-covered hills, rolling down to meet the smokey sapphire colored ocean, providing views almost too spectacular to describe. 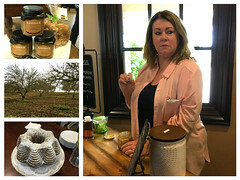 Our first stop was Limerock Orchards a walnut farm known for their walnut oils and butters, and who shares a tasting room with ROXO Port Works and Brochelle Vineyards. We were greeted by owner Deanne and taken out to the orchard to see some of the trees. The first planting of trees was done in 1963 over 23 acres in a 40 foot diamond planting pattern. Although they have a deep root system and are dry farmed, the trees are still being drought affected. They grow two primary Heirloom varieties on the property; Franquette alternate bearing trees (one year has more production of nuts than the next), which were grafted onto black walnut (Paradox) rootstock in alkaline soil and at a lower elevation; and the Hartley, an English variety planted at a higher elevation. The reason for choosing these over others is they are both higher in oil content (highest in Omega 3 & 6), and produce a much creamier nut. Harvesting is in October/ November to get the nuts as dry as they can before the harvest, so the outer skin splits and the nut removes more easily. The area has the typical diurnal temperatures of the region, ranging around 100 degrees during the day, and down to 20 degrees at night. The biggest issues that they deal with are Licken Moss in the trees and the Huskfly, which is the biggest pest. After our tour we went back to the tasting room and had a walnut oil and butter tasting, definitely worth it. We also learned that as with other oils, what deteriorates walnut oil is heat and light, if stored properly your walnut oil should have a shelf life of at least 3 years. Because of the high viscosity, walnut oil used in baked goods are much moister and we were lucky enough to find that out first hand, because Deanne had made a delicious Pumpkin Walnut cake for us to try. The next stop on our tour was Halter Ranch Vineyards and Winery, owned by HansJoerg (Jean George) Wyss. We met up with Tony the tasting room manager and Skyler, the GM. Halter has been working in phases since 2000 to improve the property and modernize their facilities. Phase one was from 2000-2010 when the winery sold about 85% of their fruit, grown on 231 acres to other wineries. Phase two began in 2011 to present and includes a brand new tasting room, a completely rebuilt winery with 22,000 square feet of floor space, state of the art green and gravity flow technology, and best of all caves with a private tasting room for members! It took 3 years to build the wine caves and all the stone work was quarried limestone from the property, and Douglas Fir trees from Oregon provided the wood used to build the winery and tasting room. They’ve also replanted the vineyards with an additional 50 acres (now 281 acre), with more marketable varietals such as Rhone varieties and Cabernet Sauvignon. Now that the winery has grown through this second phase, they take their choice fruit and only sell approx 20% to winemakers. All grapes are harvested at night because it makes it easier to de-stem them when they are firm and cold. Once harvested the grapes are poured into the hopper and de-stemmer (they have been experimenting with whole cluster fermentation, but it’s not currently part of their program) then onto the sorting table. The winery is constantly turning over the air temperature using vents on the roof and fans under the tanks (there are 18 tanks plus a few smaller ones). 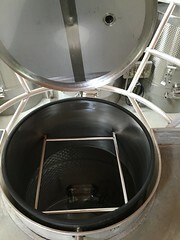 As part of their sustainability program the use of natural light from skylights is what illuminates the winery and the gravity use program employs a pneumatic punch down device that is placed on top of the tank and is also used for pump over while making for great color extraction. However the various programs affect the protocol for how much or how little extraction they get. They are very much about keeping measurable consistency, so don’t use native yeast fermentation. After touring the winery we went down into the caves where we were met by Kevin Sass the winemaker. The caves have 4 storage rooms that hold 400 barrels each for secondary fermentation. The environment in the caves is temperature controlled. They mostly barrel ferment but have cement/concrete tanks for less oxidation, 7% of which they use in the red Rhone blend. The caves have enough room for 2000 stacked barrels, but currently there are about 1400 and it is also where they store the keg- tanks for the restaurant program. We exited the tunnels right outside the tasting room where they had a lovely charcuterie and wine tasting set up. Our tasting included: 2015 Rose blend of 67% Grenache, 22% Picpoul Blanc, 8% Mourvèdre, 3% and Syrah with a 13.4% abv; 2013 CDP (Cote d Paso) which has no new oak usage but “once used” barrels instead, to keep it balanced and juicy, with lots of red and blue fruit and coming in at 14.4 abv; a 2013 Syrah that is co-fermented with Viognier to help support the tannin structure and balance out the color, and carries a 14.6 abv; the 2013 Cabernet Sauvignon that as part of their blending program is rounded out with some Malbec and Petite Verdot giving it smokey, earthy, and blackberry notes; and finally their flagship wine the 2013 Ancestor, that is named after the Ancestor tree on the property and is the largest and oldest Coastal Live Oak on record with an estimated age of 400-600 years old. Keep an eye out around September/October, they’re bottling now and will be releasing some great wines into the market toward the end of the year. 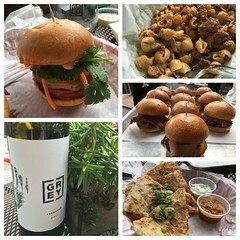 After that it was off to lunch at Grey Wolf/Barton (Krobar) home of Jeffry’s Kitchen by Chef Jeffry who prepared a lovely spread, and we had a delightful surprise visit from Joe Barton. Starting with lunch, Jeffry brought out his fresh House Made Black Truffle Potato Chips seasoned with black truffle salt and served with a Jalapeno – Citrus aioli. Next came Oak and Cherry Smoked Tri-Tip made with prime grade tri tip rubbed with “Jeffry spice”, smoked for 4 hours, thin sliced and topped with a Zinfandel BBQ Sauce, and Pulled Pork in a Red wine BBQ sauce topped with Pickled Onion- Cabbage Slaw, Sliders; followed by a Mediterranean Tuna Melt with Kalamata Olives, Marinated Artichoke Hearts and a host of other yummy ingredients topped with Provolone Cheese on Sourdough bread (all his bread comes from Edna’s Bakery); a Pulled Chicken Quesadilla, and finally his award-winning Paso Mac-n-CheeseSteak with Smoked Tri-tip and a Garlic-Provolone Cheese Sauce- all served with Grey Wolf and Barton wines. The most surprising thing about it all is that everything on the menu is smoked! My only wish was that my leg was hollow so I could have eaten MORE! It was all delicious. Joe came out and told us that though they use a lot of neutral barrels, their main focus is on making white wines. Additionally he brought out from Krobar their secret stash of an unknown proof, unreleased bourbon, that had a nice long heated finish. I can’t wait until it’s ready for sale! Since we were on a tight time limit for our last stop of the day (baby goats (Squeeee!!!) 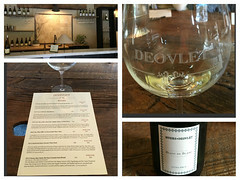 eat and mamma goats get fed and milked on a very specific time-table), we didn’t get to do our whole tasting at Deovlet but Talia took good care of us and made sure we got to taste Ryan’s newest collaboration with McPrice Myers a 2013 Blanc de Blancs Sparkling. It’s their first vintage and it’s made from all white grapes-specifically Chardonnay, picked at 18 brix and done in the méthode champenoise. It’s a very limited production only 225 cases, and sells for $50 per bottle. Our final destination was Stepladder Creamery and we were met by Sophia, Michelle and Jack for our tour. The milking takes place in the milking parlor at 6 am and 4pm, the mama goats are enthusiastic for milking time because they get a yummy goat granola treat to eat while they are being milked. Milk goes into a 75 gallon cheese vat (one vat makes 6 wheels of cheese) it takes 2 days worth of milking and one day of processing to make a 6-8lb wheel of cheese. It is then pasteurized and acid is added to make the curds and whey. The curds are heated to remove moisture and then put into molds. They are taken to the aging room, the curds are washed in a salt brine which adds flavor to the goat cheese and the rind is wrapped in muslin which helps keep interior yummy. The aging room has a relatively high humidity and is kept at 55-60 degrees. The mold blooms and is then brushed and or washed; mold blooms help age the cheese so it is done in a very controlled way and environment. Everything is done by hand, and every shelf of cheese represents a day’s worth of work. The cheddar cheese ages for 6 months minimum, and the Rioly Run is a sour beer cheese. The goats eat grains provided by the Libertine Brewery that is used to make their sour beer, so the milk is itself is infused, and then newly made cheese is washed in Libertine’s sour beer. The Paso Vino is a cow’s cheese and is washed in a Petit Sirah/Syrah mixture that gives the rind a rich purple color. The herd is made up of the Lamancha breed, “the only breed of goat developed in the United States with their unique characteristic of tiny ears”. Goats are seasonal maters, so they are bred once a year in the fall and the kids (babies) are born in the Spring, mid-February to April. Currently, there are 38 kids- many of them recently born; 24 moms and one buck. None of the goats are inbred because bucks are shared between other breeders to keep the herds healthy and viable. Once the kids are born though they are separated from their mothers after a few days to avoid damage to the mothers’ utters, because babies will often over stimulate one side. It is also easier to keep track of and make sure all the babies are evenly fed. Speaking of, after our tour of the facility we were given bottles of milk to feed the kids with which, if you haven’t ever fed a baby goat is an opportunity not to be missed. 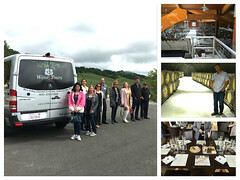 This experience with 101 Wine Tours is just one of many offered, but definitely one you should consider taking or at least including in your itinerary. 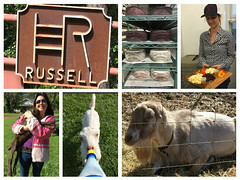 What a great day we had and of course the creamery goats and tour was a perfect topper. Hilary, you did an amazing job at capturing the events of the day. It was such a pleasure to have you included in the media event, and I look forward to offering more unique experiences in the future, and hearing your perspective.